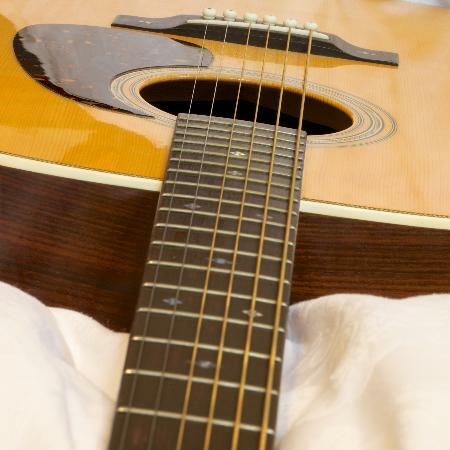 Guitar Lessons - Tuition: Boroughbridge, Knaresborough, Ripon, Thirsk, Easingwold and surrounding areas. Learn the guitar - improve your playing. GUITAR LESSONS TUITION Boroughbridge Knaresborough Harrogate Ripon Thirsk Easingwold Wetherby York. I teach in my music room at my home address in Minskip, near Boroughbridge. Within 6 miles: Boroughbridge, Staveley, Aldborough, Roecliffe, Langthorpe, Arkendale, Marton, Grafton, Kirby Hill, Farnham, Burton Leonard, Skelton-on-Ure, Great Ouseburn, Knaresborough. Witihin 9 miles: Bishop Monkton, Disforth, Green Hammerton, Ripon, Whixley, Linton-on-Ouse. Since I started teaching again at the end of 2011 I have helped 50+ people start or get better at playing the guitar and begin to express themselves through music. They have ranged from teenagers who want to play the electric guitar, people in their 20s who want to be able to play to entertain their mates, to mature adults who have finally decided to learn the guitar or wanted to get more accomplished and relaxed in their playing. With the help of their parents we have got many children enjoying learning a musical instrument (the very versatile guitar). During the lessons I may use the internet to assist in the teaching process and show how it can be used as a resource to make your learning more fun and efficient. Sometimes I will record video clips to help you with your practice. Most people don't have the time and money to commit to weekly lessons so normally we arrange fortnightly lessons. The lessons are £20 for 55 minutes. The first one is free. Go on - give it a go! Phone 01423 325796 - James Drake. Amenities: Our House, The Old Post Office, Minskip, is the house with the BT phone box in front of it. I teach in my study, that is partially soundproofed and has a sofa for parents accompanying their children for lessons. The room is set up with internet and video facilities to help with lessons.